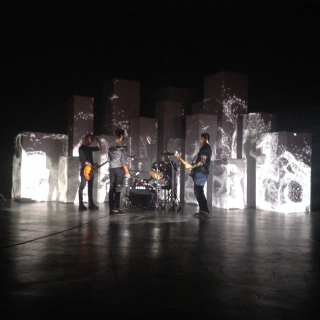 Lightware Visual Engineering’s MX8x8DVI-Pro matrix router played a key role on the set of the new “Tragedy + Time” music video from the American punk rock band, Rise Against. Lightware USA is the US distributor of Lightware Visual Engineering products manufactured in Budapest, Hungary. Rise Against's music video "Tragedy + Time"
“Tragedy + Time” is from the band’s latest album, The Black Market, and was directed by Wes Kandel and Casey Hupke of Zoic Studios. It features the band performing against a backdrop of stylized skyscrapers on which lighting effects and moving video images are projected. Media server programmer Cory Froke, of Chaos Visual Productions in Burbank, selected the Lightware router to work in conjunction with a mixed d3 Technologies master server and a d3 understudy, which fed two stacks of two Barco FLM-HD20 ultra-bright projectors. Rectangular cardboard boxes covered in butcher paper and standing on end were the skyscraper-like set pieces mapped with dynamic, patterned imagery.